French Perle White Dinner Plate - 10.75"
Crafted of sculpted stoneware, the French Perle Groove dinnerware is perfect for every occasion. French Perle Groove White Dinner Plate - 11"
Capacity of bowl: 16 oz. 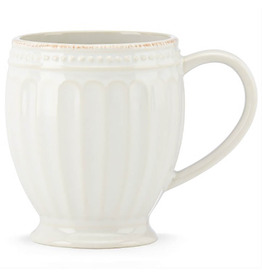 ; mug: 12 oz. French Perle Bead White Dinner Plate - 10.75"
Crafted of stoneware, the French Perle White is perfect for everyday use. But with its beaded motif resembling beautiful embroidery, French Perle dinnerware is dressy enough for more formal occasions as well. French Perle Bead White Accent Plate - 9"
9” accent plate - mix and match!